There are two main situations where this vaccine is used in travel medicine. 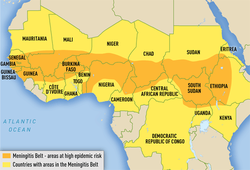 (1) The meningitis belt is a swath of territory across Africa in which outbreaks of meningococcal meningitis are fairly frequent and sometimes large. These occur mainly in the dry season (in many areas December to June). The map below shows the countries within the belt. The affected areas are in darker orange. Outbreaks can occur elsewhere. (2) Travellers to Haj and Umra in Saudi Arabia are required to have proof of immunization with the four-strain (quadrivalent) meningococcal vaccine when applying for visas. We stock this vaccine and are able to obtain the hallal-certified brand name (Menveo). In this case, please mention that this is the type you prefer when booking your appointment, and also when you see the doctor or nurse. Check the section of this website that lists our fees to see the cost of this vaccine.